Aspire Atlantis Coil Heads 0.5ohm Price is per one piece ..
Βlackcurrant Concentrate Notes: Please make sure you mix it with a base liquid before vaping. (Check product Specifications) .. Deep Blue - Sergeant 50ml - FYT HOLIDAY SPECIAL: Buy one FYT (Free your Taste) product and get one free! Offer expires 15/1/2018 The Captain and his crew will pour you smoky whiskey and offer sweet treats of caramel and chocolate, in this very.. Deep Blue - Sergeant Concentrate 10ml The Captain and his crew will pour you smoky whiskey and offer sweet treats of caramel and chocolate, in this very special, “navy” blend. Notes: Please make sure you mix it with a base liquid&n..
eCig - Silicone AntiSlip Ring Protect your atomizer with this silicone ring from eCig ..
eCig - Silicone AntiSlip Ring Protect your atomizer with this silicone ring from eCig For atomizer diameter 14mm - 18mm ..
eCig Resistance Kanthal 26GA wire 0.40mm ..
eCig Resistance wire Kanthal 0.254 ..
eCig Resistance wire Kanthal 0.35mm ..
Silicone AntiSlip Ring For atomizer diameter 18mm-20mm ..
UD Kanthal Twisted Wire 26ga Χ 2 Kanthal wire twisted for reparable atomizers. Item contains 5m. ..
UD Kanthal Twisted Wire 28ga Χ 2 Kanthal wire twisted for reparable atomizers. Item contains 10m. ..
UD Kanthal Twisted Wire 28ga X 3 Kanthal wire twisted for reparable atomizers. Item contains 5m. ..
UD Kanthal wire 0.32mm 10m ..
UD Kanthal Wire A1 26ga Kanthal wire for reparable atomizers. Item contains 10m. ..
Vandy Vape Kanthal A1 26ga Wire - 10m ..
Vandy Vape Kanthal A1 28ga Wire - 10m ..
Apollo Kanthal A1 Alien Wire 0.3x0.8+32ga / 0.45ohm / 5 Coils / 3mm core / 5 rounds Top-notch wires for top-notch vapers. 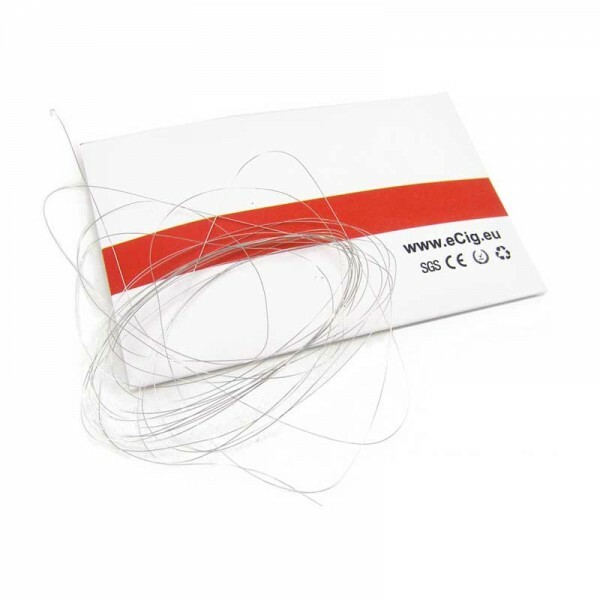 ..
Apollo Kanthal A1 Alien Wire 0.3x0.8+32ga / 3m Top-notch wires for top-notch vapers. ..
Apollo Kanthal A1 Fused Clapton Wire 2x26ga+34ga / 0.7ohm / 5 Coils / 3mm core / 5 rounds Top-notch wires for top-notch vapers. ..
Apollo Kanthal A1 Fused Clapton Wire 2x26ga+34ga / 3m Top-notch wires for top-notch vapers. ..